108 Heroes is powered by Microgaming and is available in Flash. In this slot you are tasked with a special mission: unite with the 108 Heroes of Liang Mountain to reclaim the treasure. Rebellious spirit against the power of corruption is highly rewarded! As the reels spin, you will watch in anticipation for the highest paying symbol, 108 Heroes, which catches the gaze of even the newest of heroes. 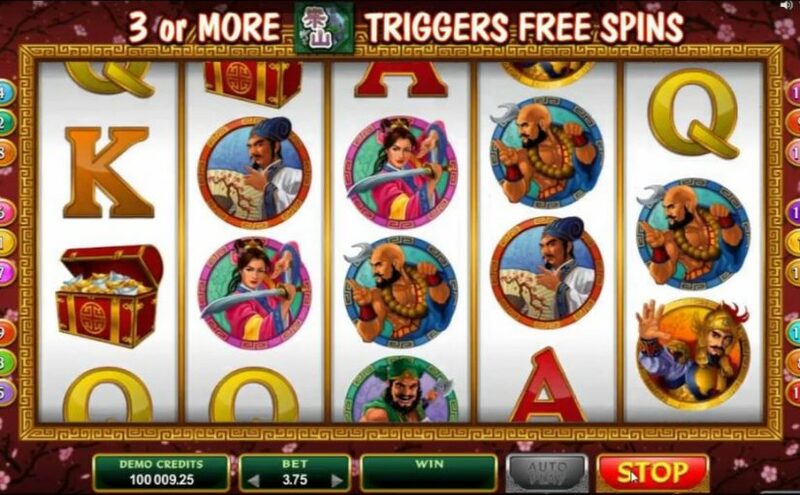 Three or more Liang Mountain scatter symbols will trigger 10 Free Spins where all wins are tripled! When 3 or more Treasure Chest symbols appear, players are treated to the King’s Treasure Bonus game where every chest wins! The epic movie-inspired music, forceful yet melodic, evokes the mountain stronghold of the 108 Heroes. Thematic sounds punctuate wins adding excitement to winning symbols and heroes. The music intensifies during the bonus games, engaging players as they become one of the legendary 108 Heroes!